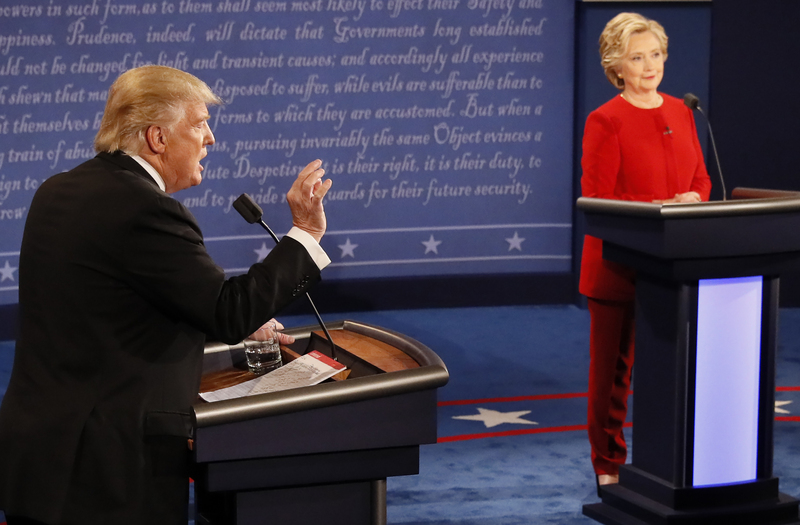 Last night’s first presidential debate gave us plenty of frustrating and sometimes baffling moments, but one thing that stood out to a lot of viewers was the way that Donald Trump interrupted Hillary Clinton over and over and over again. Trump’s incessant, repeated interruptions (Vox counted 25 within the first 26 minutes alone!) were jarring, but they also spoke to a communication dynamic that is all too common — that of people (male and female) interrupting and speaking over women, and in the process devaluing their points of view. Decades of research have shown that women are routinely interrupted more than men, and that when they do get the opportunity to speak, they are often either ignored or even punished for voicing their opinions. Trump’s ceaseless interjections during the debate may have been a particularly grating example of the phenomenon known as “manterrupting,” but this is something that many women face on a smaller scale every single day. Amid Monday night’s tangled discussions of foreign trade, race, tax returns, ISIS, and — for reasons that remain a mystery to me — Sean Hannity, Trump interrupted Clinton 51 times, according to Vox. That’s three times the number of moments in which Clinton interrupted Trump (17). Moderator Lester Holt added to the interruption tally as well, with 19 for Clinton and 30 for Trump. (Holt interrupted Trump considerably more often than he did Clinton, which could be a due to the fact that he was trying to wrangle Trump’s repeated interruptions.) Even so, Trump got through the debate having been interrupted only 47 times — compare that to Clinton, whose speech was disrupted 70 times in about 90 minutes. Obviously, we can’t prove that this particular discrepancy is due to gender bias. A lot of factors go into how people communicate, and one could argue that Trump simply interrupts everyone, regardless of gender. But what’s not debatable is that gender does play a major role in communication, that women are interrupted more, and that in professional situations, they speak less than their male counterparts. A sociological study dating all the way back to 1975, for example, analyzed 31 sample conversations recorded in public places. The researchers found that when a man and woman were speaking, men did the interrupting 96 percent of the time. In 2014, researchers at George Washington University had 40 volunteers (20 male and 20 female) discuss gender-neutral topics. Upon analyzing the conversations, they found that both women and men were more likely to interrupt women than men. On average, a woman speaking to a man interrupted him once, while she would interrupt another woman 2.8 times. When a man was talking to another man, he interrupted his partner twice; when he was speaking to a woman, that number went up to 2.6. This imbalance extends to specific professional fields as well. For instance, a 1998 study found that both male and female patients are more likely to interrupt female doctors than their male colleagues. You might think that the solution to this problem is simply for women to be more forceful and to speak up, but research has shown that women who make themselves heard are often not rewarded for their efforts. For example, a 2012 study by Yale psychologist Victoria L. Brescoll looked into how people assess competence in their superiors. When male and female employees were asked to evaluate male execs who spoke more than their peers, they rated them as 10 percent more competent than their less-talkative colleagues. But voluble female execs didn’t get the same boost: When male and female employees evaluated female executives who spoke more than their colleagues, the employees dropped their competency ratings by 14 percent. Where male executives were rewarded for speaking up, women who did the same thing were actually punished. Thankfully, Clinton seemed unruffled by Trump’s frequent interruptions during the debate, which may not be surprising, given her history. (She’s had decades to learn how to negotiate the challenges of being a powerful woman in male-dominated spaces.) As Trump repeatedly cut into her speech, she either simply kept talking or paused to let him make his point. Often, letting Trump speak seemed to work in her favor. As he exposed himself as impulsive and belligerent, she appeared perfectly cool and collected.